My first character lasted 30 minutes. After washing up on the beach, I stumbled into the first town I came across. I scraped together a couple cans of food from the buildings before I was spotted by a zombie. I didn't bother thinking about which way I was going and just ran. I lost the zombie and found myself in a swamp. My character had been screaming for a drink since I started the game, so I crouched in the brackish water and took a few drinks. Bad idea. Before long, I was sick, and not long after that, I was attacked again. Without any medical attention, my vision blurred, color drained from the world. I could feel the blood on my clothes, and could see spurts of it coming from my side. I lost consciousness on the road and died a few minutes later. My introduction to Day Z was appropriately harsh. It's not like any other game I've played. There are very few concessions made for the average player. Very little information is presented at the outset, so learning that there are mechanics for hunger, thirst, blood loss, injuries, even body temperature and disease is learned through player attrition. You lose a few characters before you learn to bandage your wounds, wear dry, warm clothes and not eat rotten food or drink dirty water. We aren't used to having to account for these real world concerns in a virtual presentation. It creates a dissonance in our general play tactics. 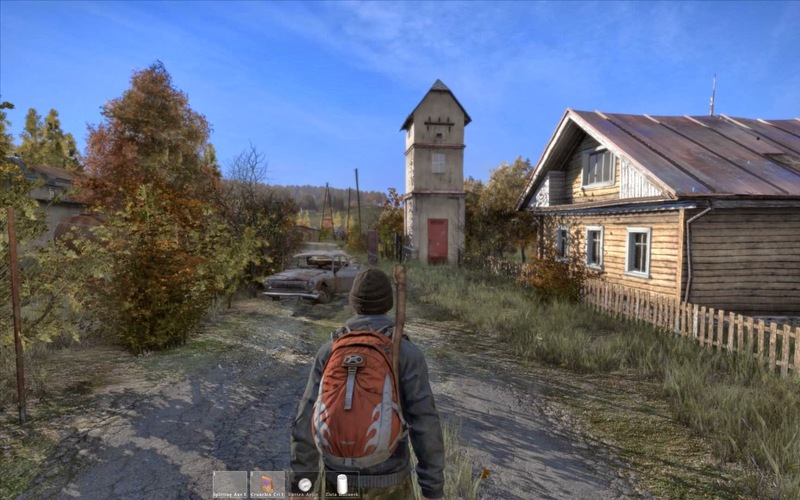 So many common design choices made for player convenience are absent from Day Z. Strikingly though, the absence of things like the ability to run everywhere without ill effect is not annoying. Rather, it heightens the experience. Immersion is a sort of golden apple for many games. Something that is sought fervently, but remains just out of reach. It's accomplished to varying degrees here and there. 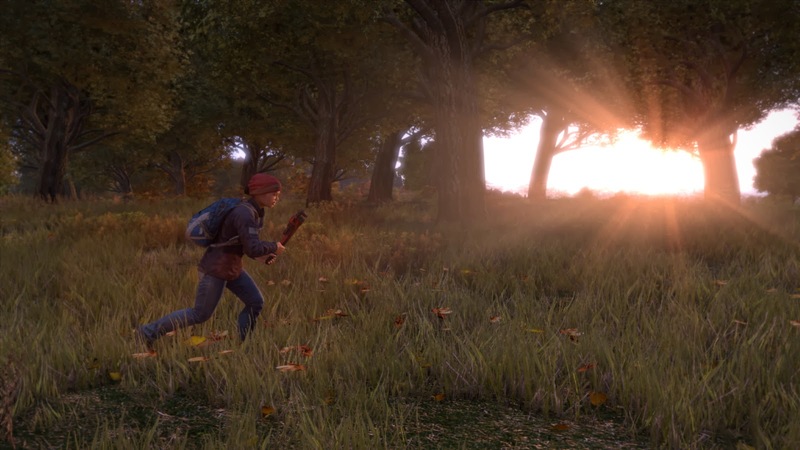 Day Z accomplishes the closest thing to complete immersion I've yet encountered. Every session I play is fraught with terror, and I have never ended a session without an incredible story. For example: My latest character got pretty lucky early on. I found a small barracks in the woods and looted a large backpack, a ballistic helmet, some food, a sterile bandage and an M4 with a suppressor. No ammunition, no melee weapons, but still a good haul. Jump to the next evening. Day Z at night is a different world. It's impossible to see anything without a flashlight. You're forced to listen more to the environment. At this point, I had taken shelter in a house to bandage my wounds after another nasty zombie encounter. I was still in bad shape and still had no water or food I could eat (I had a few cans but no way to open them). I was desperate. Remembering that the clouds always move from west to east, I headed south towards the coast, hoping to find a town that I could scavenge. I breather a sigh of relief when I heard the surf and saw the farm fields and street signs illuminated in my flashlight beam. Then I saw something that stopped me dead in my tracks. Across the field, along the road was another flashlight beam. There are two types of people in Day Z. Heroes will help you out, give you food and bandages, sometimes even weapons. Bandits want whatever you have and will do whatever they have to to get it. If you're helpless, like me, it's best not to find out. I shut off my light and went prone. I managed to get to the coastline and the town's dock. From there I hoped to loop around the coastal wall and slip into town behind the flashlight bearer. But evidently, their route took them closer to the dock than I had anticipated. The flashlight appeared again, not 100 yards away. I bolted away from town. Everything looked good at first. Then that back of my character lit up as the unknown person's flashlight beam fell across it. the light disappeared for a moment, then I heard two shots. Luckily, neither one hit me and I continued to run for as long as I could force a sprint out of my character. Later, I got a grasp of my surroundings with a quick look from my flashlight, found the railroad tracks, switched off the light and used the sound of my feet on the tracks to keep me on the same heading until I found a rail yard with an axe, a canteen and some cereal. I was saved. Keep in mind, both of these stories came from the very early alpha of the standalone. Day Z is a long way from completion, but it's already an incredible experience. 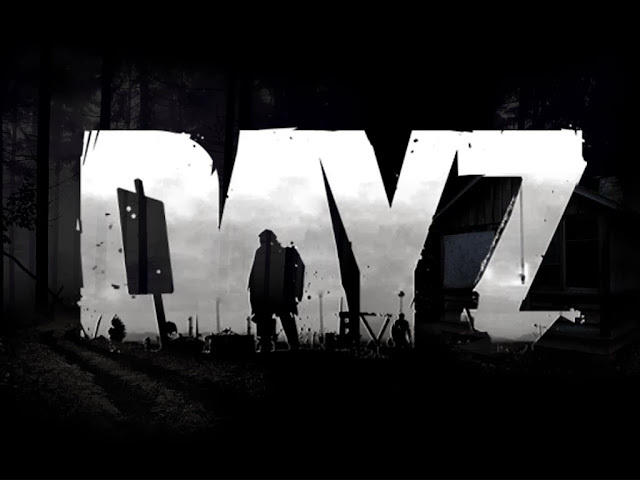 I have put more thought into my movements and actions in Day Z than almost any other game, and I've enjoyed it far more than any other MMO type game I've ever played. Future updates promise to add vehicles, more zombies, new weapons, gear and clothing. The game has it's share of bugs, but it's an Alpha release. At this stage the game is more incomplete than finished product. Complaining about bugs at this stage is wholly pointless. The game looks incredible for an Alpha release. It's a wonder we don't have placeholder models and images for many items in the game. The amount of work put into it already to take it from a mod to a standalone game in just one year is very impressive. Day Z is committed to creating a complete, authentic experience, and I am more than happy to be a part of every step of the process. You can be a part of it via Steam.